As a mother I admired most the Sasha Morgenthaler dolls for their clearness of design and convincing functionality as a good play doll. 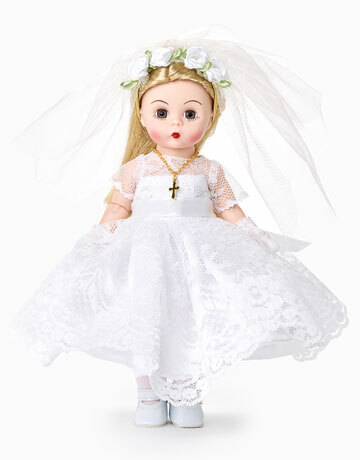 There is a special air about Sylvia's dolls... a certain 'je ne sais quoi as' the French say. It's hard to put your finger on it, but the appeal is irresistible. Friendly, quiet, innocent... these are children as they should be in a peaceful and protected world. Sylvia's philosophy is that dolls need to remain dolls. She sculpts simple, unpretentious impressions that allow the imagination to wander. You see what you want in their unassuming, gentle expressions. Her dolls become what you want them to be, truly the foundation of creative play. Aside from their sweet appeal, the construction of Sylvia's dolls is superb. Ranging in sizes from 13.5" to 19", their full-vinyl bodies are crafted from a more durable, thicker material ensuring that they will be played with and loved for a lifetime. Beautifully balanced, their five-way jointing allows for easy, stand-alone posing. Sylvia designs all of her dolls' outfits and accessories with a simple, yet elegant, stylish flair that appears effortless. 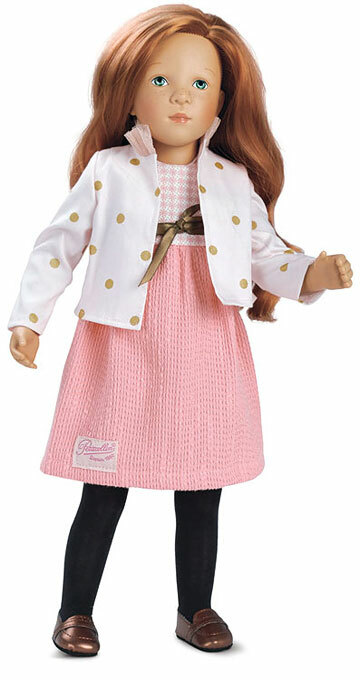 Her eye for fashion pairs well with the soft lines and curves of her dolls. Many include an accessory such as a 1900s French-style baby doll, a trunk of outfits or a box that transforms into a bed. 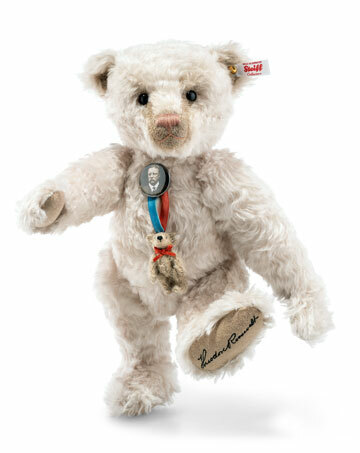 Sylvia's baby dolls and children are cherished by doll fans of all ages. They allow a little girl or boy to grow and develop while offering collectors unconditional love and companionship. Sylvia loved growing up in the French speaking part of Switzerland. In fact, over the years her French-Swiss origin has provided much inspiration for the names of her doll collections. Sylvia has always had a love for dolls. She remembers her first dolly very well; a 1950s Schildkrot doll made of celluloid with molded hair and painted eyes who was her best friend and confidant. Growing up, she even applied her natural artistic talents to making dolls and doll houses. As a young adult, her artistic passion grew as she studied artistic theory and she eventually taught creative subjects. After the birth of her daughter, she stopped teaching and moved to Munich, Germany. Here she joined Kleines Spiel, a puppet theater for adults. Sylvia was inspired to create a wood composition puppet for her daughter. It was easy for Sylvia to find familiarity in the style of reknown dollmakers such as Kathe Kruse, Sasha Morgenthaler and Elisabeth Pongratz. In the early 1900s, Kathe Kruse designs exemplified this style which crystallized in the 1940s, 50s and 60s with Sasha Morgenthaler dolls. In the early 1970s, Sylvia met Elisabeth Pongratz, a doll artist who was reinvigorating this simplistic, elegant style with the New Munich Art Doll movement. 'We shared our experiences in dollmaking for many years and held a doll shop together.' In the early 80s, she met Hanne Adler-Kruse, daughter of the famous doll designer Kathe Kruse. Their friendship grew and eventually Sylvia designed two dolls for Kathe Kruse. With the popularity of her highly sought porcelain dolls, Sylvia dreamed of designing a fine vinyl doll that would be more affordable for children. That dream has come true. Made by The Petitcollin company, Sylvia's dolls are crafted with the highest standards. She personally chose this company because they are the last and oldest doll company who still produces dolls in Europe. Today, her line of vinyl dolls captures the hearts of collectors and children around the world.